Our premium bell fob features a new solid-brass petal bell, size #2 (1 1/4 across) or #4 (1 1/2") on a bridle leather backing. The fob can be used to hold keys or used as a "bear bell" -- fasten it to your backpack, bicycle, or horse for hiking or riding the trails. Available with a steel split ring (key ring) or a solid brass snap and your choice of gold- or silver-colored bell. Click "View more images" to see the snap. 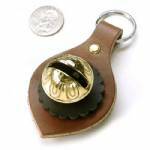 The bridle-leather fob is available in black, dark brown, medium brown, or red. View colors... The decorative leather rosette behind the bell comes in a variety of accent colors. Overall length is about 3 1/2 inches with the split ring and about 4 1/2 inches with the snap.